A South Korean brokerage mistakenly paying 1,000 shares in dividends instead of 1,000 won ($0.93) due to a computational error Friday has exposed a major loophole in the nation’s stock trading system, prompting immediate intervention by regulators. Starting Monday, the Financial Supervisory Service will launch an inspection into internal system flaws at Samsung Securities, the nation’s fourth-largest brokerage, where the incident happened last week, officials said Sunday. The authorities will also look into accounting management system of all brokerage firms and the trades of securities-linked futures. 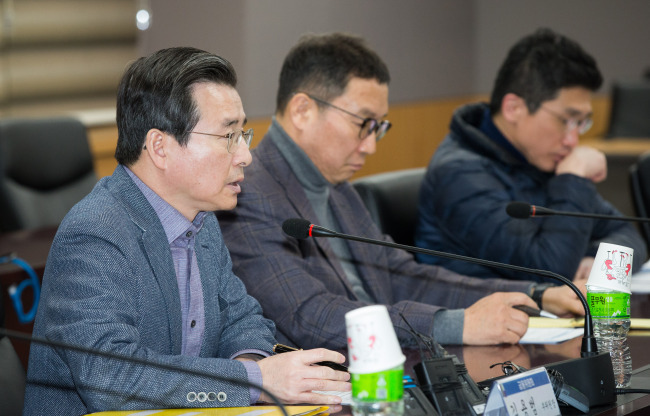 Apologizing for causing the public concern, Kim Yong-beom, vice chairman of the Financial Services Commission, said the government is taking the case seriously and will deliver countermeasures to restore market confidence. Such measures came after an irrevocable accidental input error on Friday -- “share” instead of “Korean won” -- caused Samsung Securities to pay dividends to shareholding employees of a combined 2.8 billion shares, instead of 2.8 billion won ($2.6 million). The value of dividends offered to employees due to the “fat-finger” slip-up came to 112.6 trillion won, over 40,000 times the intended value and 33 times greater than the company’s market cap. The share price of Samsung Securities severely fluctuated Friday. Taking more than 11 percent in loss from Thursday‘s closing price in the morning -- to 35,150 won at its lowest -- Samsung Securities on Friday closed at 38,350 won, down 3.6 percent from Thursday. Meanwhile, Samsung Securities said in a statement that it will compensate those who have been affected by the error, and reprimand workers subjected for moral hazard. But the incident shed light on Samsung Securities’ ability to issue unauthorized stocks and misappropriate them. Of all shareholding employees who were mistakenly given shares that did not exist, 16 of them instantly sold off over a combined 5 million stocks, raising issue of moral hazard. Despite not withholding its own shares, the brokerage was able to create new stocks through a simple keyboard input, drawing speculation that such “virtual stocks” could be traded like real stocks and that could be carried out without reporting it to the brokerage. The FSS also reportedly accused Samsung Securities of failing to have multilayered screening of the dividend payment process. Angry investors have been posting in an online petition to the South Korean presidential office Cheong Wa Dae. As of Sunday at around 6 p.m., one of the online public petitions demanding a stronger oversight on Samsung Securities had collected some 137,000 signatures in just two days. “The recent incident shows that a securities firm can create and sell its shares at will, then shouldn’t we see this as fraud?” read the petition posted Friday. If the number of public endorsement reaches 200,000 within a month after the petition was posted, the presidential office and other government agencies related to the issue will look over the case. The petition also expressed concerns that such trading of unauthorized stocks could be misused in short selling without borrowing, while demanding an all-out ban on short selling on South Korea’s financial market. Short selling refers to the sale of assets that a seller does not own. Through the activity, a short seller borrows assets from a certain entity, sells them, then repurchases the assets to return them to the lender. The short seller gains profit when the value of the assets depreciates. “We demand a repeal of short selling because ordinary people have always fallen prey to it,” the petition reads.